Special offer for "Kukcha Kurgony" residential complex habitants! The first 40 habitants that have purchased an apartment before September 1, 2015 are capable to get a personal parking place upon condition of renovation finished* by December 31, 2015. 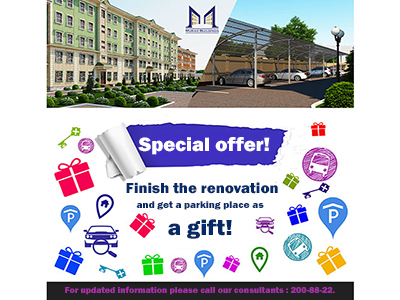 Right of parking place choice ** is realized on in turn basis, according to renovation finish line (first renovation finished habitant is to choose a parking place at first and by turn henceforth). Floors are performed in laminated material, oilcloth, ceramic tile, parquet. Electric conduit is carried out as well as illuminating equipment & switch sockets etc. **The parking space is furnished with metal, shaped boarding shed 2.8m – width, 5.2m – length, 2.3m – height. Some changes may appear in action details. For updated information please call our consultants : 200-88-22.